Posted on 21, October 2016 by EuropaWire PR Editors | This entry was posted in Automotive, Business, Germany, Transportation & Logistics and tagged Bodo Uebber, Daimler AG, Dr. Dieter Zetsche. Bookmark the permalink. STUTTGART, 21-Oct-2016 — /EuropaWire/ — Daimler AG (ticker symbol DAI) posted record unit sales and EBIT adjusted for special items, thus continuing along its successful path. In the third quarter of 2016, Daimler sold 754,100 cars and commercial vehicles worldwide, more than ever before in a third quarter and surpassing the total for the prior-year period by 5%. In the first nine months of the year, the Group’s unit sales increased by 6% to 2.2 million vehicles. 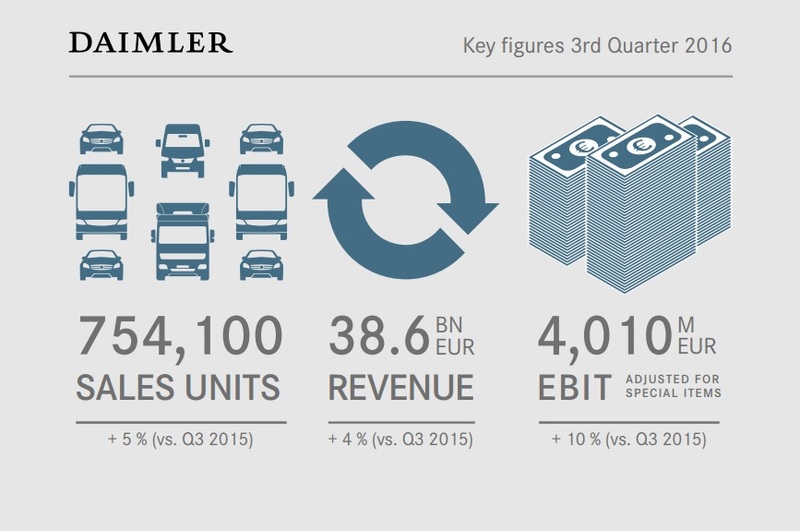 The Daimler Group’s third-quarter revenue amounted to €38.6 billion, which is 4% higher than in the third quarter of 2015. Adjusted for exchange-rate effects, revenue grew by 3%. The division’s revenue decreased from €9.7 billion to €7.9 billion. Daimler Trucks’ EBIT of €464 million andreturn on sales of 5.9% were significantly lower than the high levels of the prior-year period (Q3 2015: €791 million and 8.2%). Negative effects on the division’s earnings primarily resulted from lower unit sales in the NAFTA region, Turkey and the Middle East. Earnings were also reduced by intense competition in Europe. The realization of further efficiency improvements and exchange-rate effects had positive effects on earnings. EBIT also includes expenses for workforce adjustments in the context of ongoing optimization programs in Brazil. Demand for medium- and heavy-duty trucks in the regions important for Daimler should be perceptibly below the prior-year volume. A major negative factor is the expected significant market contraction in North America. In a comparatively weak overall investment environment, from today’s perspective, demand in the market for Classes 6­8 trucks can be expected to decrease by approximately 15%. But the European market has so far proven to be relatively resilient and should continue its recovery with growth of 5-10% in the full year. There is still no turnaround in sight for the Brazilian market; due to the ongoing economic recession, the company has to anticipate further market contraction there in the magnitude of 25%. The situation of the Russian market has meanwhile stabilized somewhat, so it should not contract any further than its very low prior-year level. Demand inChina will recover significantly after last year’s sharp market contraction. The Japanese market for light-, medium- and heavy-duty trucks continues its solid development and should be close to its level of 2015. TheIndonesian truck market is likely to contract once again, however; from today’s perspective, Daimler anticipates contraction of approximately 15%. In India, only slight growth is meanwhile expected in the segment of medium- and heavy-duty trucks. Daimler now expects a significantly larger market volume for buses in Western Europe in 2016 than in 2015. InBrazil, further significant market contraction is anticipated in full-year 2016. On the basis of the anticipated market development and the assessments of the divisions, Daimler assumes thatEBIT adjusted for special items will increase slightly in 2016. In order to achieve its ambitious growth targets, Daimler will once again significantly increase its already very highinvestment in property, plant and equipment in the year 2016 (2015: €5.1 billion). In addition to capital expenditure, the Group is developing its position in the emerging markets by means of targeted financial investments in joint ventures and equity interests.